Pictured in early April is our nation’s largest Black Cottonwood (Populus Trichocarpa). Standing 158′ high it is over 110′ wide. The circumference at the base of the trunk is over 27′. It is estimated to be about 265 years old. Black Cottonwood’s are common in the western United States. They can be found all along the banks of Oregon’s Willamette River. 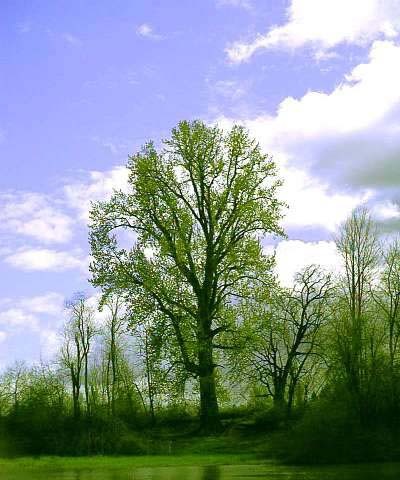 The Black Cottonwood is also knows as the Balsam Cottonwood or Western Balsam Poplar. The picture shown had to be taken from over one hundred feet away, it does not show the true magnitude of this tree’s giant size.